C.C. Baxter (Jack Lemmon) is your average working Joe but with one difference – he has managed to get into a situation where his apartment is being used by several men above him at work as a love nest for their illicit affairs. He’s not happy with the situation, but seems unable to extract himself. He’s interested in the cute and sassy elevator gal Fran Kubelick (Shirley McLaine), but she’s hesitant. It’s a comedy of errors with some genuine tragedy and emotion. I must admit, I never got the appeal of Shirley McLaine. I always thought she was a bit a nuts old woman who heard from the spirit world and liked Andrew Peacock. When you see a performance like this, you see what she is all about. I’m now desperate to see more of her work; funny and dry and delightful. And then Jack Lemmon; the man who makes what are probably well-crafted lines seem like off the cuff comments. Wonderful. It won a whole lot of awards and inspired many filmmakers, and no wonder. It’s so well crafted, even though it feels very much of its time, it hasn’t dated. Having said that, I hope no-one ever decides to remake The Apartment because it would be a total disaster. 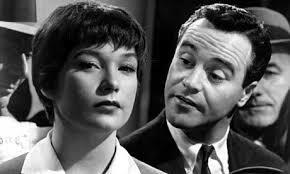 The Apartment won Oscars for Best Picture, Best Director (Billy Wilder), Best Writing, Story and Screenplay -Written Directly for the Screen, Best Art Direction – Set Decoration, Black-and-White and Best Film Editing and was nominated for Best Actor in a Leading Role (Jack Lemmon) Best Actress in a Leading Role (Shirley MacLaine), Best Actor in a Supporting Role (Jack Kruschen), Best Cinematography, Black-and-White (Joseph LaShelle) and Best Sound.